The type of grass found on a golf course has a lot to do with climate. In the early days of golf, people didn't give a second thought to the types of grasses on the courses. The grass was whatever grew naturally in the links' sandy soil along Scotland's coast. But today, the kind of grass is a key part of the game. Advances in landscaping, course design and turf grass maintenance help determine the choice of grass on golf courses around the world. The kinds of grasses vary the greatest on golf course fairways. Most courses older than 25 years have perennial ryegrass or Kentucky bluegrass fairways. These are low maintenance and durable grasses that hold up in many kinds of climates, and can withstand a lot of play. However, newer courses built in northern climates after 1980 often use creeping bentgrass in the fairways because it tolerates low cuttings. 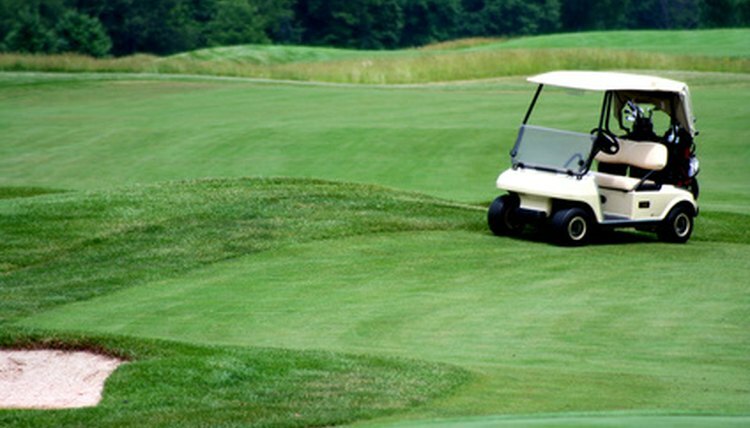 Some courses, mainly in southern climates, also use zoysiagrass, which can tolerate high heat and drought. Grass just off the fairways on most courses is either Kentucky bluegrass or perennial rye. These are hardy grasses that can thrive in most climates, and do well when they grow a bit longer. Most of the rough on courses often is as much as one-half inch or more longer than the the grass on fairways. Bluegrass and ryegrass are suitable for the rough because they do well in longer lengths. The operators of most modern-day courses prefer bentgrass or Bermuda grass on the greens. Bentgrass does well in northern climates, and Bermuda grass grows well in southern climates. You can cut both extremely low without stressing the plant, and create a smooth putting surface. Many older courses still have ryegrass or poa annua (annual bluegrass) on the greens. These tend to be hardy grasses, but sometimes create a bumpier surface.